One of the most significant and useful parts of the age-old Chinese practice of Feng Shui is the use of the Bagua map, a system which divides any space into 9 "houses" each one relating to a specific aspect of our lives. These 9 houses refer to the 8 cardinal points of orientation (North, North-East, East, South-East, South, South-West, West, North-West) and a 9th referring to the centre. In order to resolve something in one specific part of our life we should look at that "house" which is relevant to it in our space. In the previous module, Fundamentals of Feng Shui, we looked at a brief overview of the Bagua map and its functions. In this module, we will look at the concept in further detail, and by the end of it you should be able to apply this system to any space, project and to any client context, personal or business. The Bagua can be used in two mainly distinct ways, the classical Feng Shui method and the Tibetan Black hat. The way of the classical Feng Shui (left chart), is the original method which initiated the practice 4000 years ago, and uses compass orientations to define these 9 areas. The second method is the Tibetan black hat method (right chart) which originated in the 80's when Feng Shui began to become popular and widespread across the west. The Tibetan Black Hat method is also known as the 3-gate method, because the house can be entered by any of the three gates at the bottom of the plan on the wall which has the front door. As it is more modern, it is more aligned with intentional principles. The center of the bagua is known as the Tai Chi. In the Tibetan method, we put the center of the bagua, the Tai Chi, on our heart and overlay the plan on our home, and by doing so we set the intention of the work which is about to be done. If the door of the space is aligned to the North, both methods of applying the Bagua map will be the same. If your door is NOT facing north, you have two options on how you can layout the map. You can choose to use your front door or the cardinal points (as marked on the image with the small letters) as the reference to map out the 9 houses as per the diagram. If you use your door to map your bagua, it means you believe your main source of Chi is the entrance. If you use the cardinal points, you believe the main source of Chi is the sun. This second way is more aligned with the principles of ancient civilisations, however, in Feng Shui, it is believed to apply only when you live in the countryside and don't have any neighbours blocking the sun. This small city appartment is facing West as indicated above. The two below floorplans indicate how the bagua map would be applied using either of the two methods. this larger appartment has a doorway facing North-East. With both methods being considered equally appropriate, how does one choose which way to go? Generally, we will choose the compass method if the house is in a less urban area with more space around it and less neighbours and obstruction. The Tibetan black hat method will often be used in more urban areas where there are more neighbours, or in appartment blocks. The tibetan black hat is also more popular in modern Feng Shui which is all about personal intention. It aims to create a microcosm of the macrocosm within a space. With time, you will find that your intuition will guide you to make the decision. There are also methods to ask the home which bagua map method should be used which we will explore together. As the Bagua represents the journey of our life from the beginning to the end, and the areas are numbered 1 to 9, number 1 represents the beginning of everything. In the beginning of our existence, in our pre-embryo state, we are made of water. Therefore, the dominant element of this area is Water. As number 1 it marks the beginning of our journey through life, it represents our life mission, our purpose which is the main reason why we are here, most importantly, our soul journey. In the Tibetan black hat method, it is the area that encompasses the street level to the front door. The fact that this area is number 1 is representative of the fact that if our purpose is aligned, everything else falls into place. As number 1 is water it is about free flow, and symbolically, it represents that our career should be flowing and not too painful or effortful. This area governs your career and business. The colours recommended to use here are black and blue, the shapes are organic and flowing. A fish tank, a fountain and things in odd numbers are good here. If you cant have a water feature or fish tank, a picture of a water feature, or lake or the sea is great. Keep this area light and airy, add light if needed. With others and with ourselves. House number 2 is the area for all relationships, though most people usually focus on romantic ones. 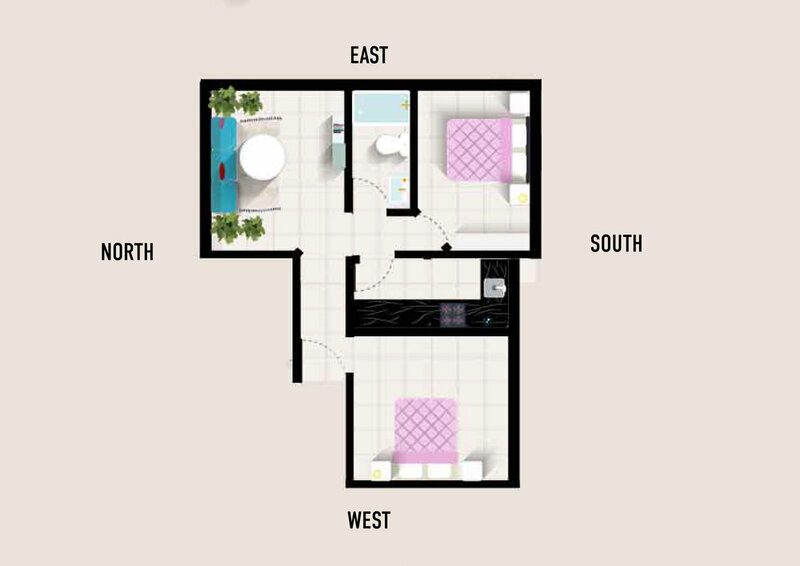 It is ideal for the bedroom to be located in this area and the best colours to use here are pink, peach and orange, the best shape is square and the dominant element here is earth. Keep decorative elements in pairs, such as candles, or small statues. Keep them together rather than on either side of the room which represents separation. Beware of beams in these areas as they will represent separation and extensions as well as they will often represent that someone wants to leave the relationship. Photographs of couples or things that are in pairs work best here. The element here is fire, so do try to keep candles if you can. If your relationship is in trouble, make sure you have a space in this area where it's comfortable to sit and talk. If you are single looking for a relationship, make sure the room feels like it's ready to welcome a permanent guest. House number 3 relates to all issues regarding ancestry and family. This is a great space to bring attention to if you feel you have some issues with your family which need resolving. It is recommended to place elements in 3's here. For instance 3 plant pots full of earth and will one seed planted in each. It is believed that when the 3 seeds have bloomed, your will have seen resolution in the family issues. It's also great to have images of trees as they represent the tree of life, where your roots are. Also place family heirlooms you have been gifted or photos of your family. A great colour to use here is dark green, the dominant element is wood and the shape is rectangle. This area relates to your relationship to prosperity or abundance. It's recommended, however, to use it more to symbolise how you are feeling blessed, or grateful in your life. Do we generally feel blessed in life? Can we find ourselves asking the questions such as "How can it possibly get better than this"? It's important to keep this area bright and airy, with lots of natural light if possible, for the Chi to be drawn in. A great colour here is grass green, apple green or mint green, after all, green is the colour of money and the element is wood. Big leafy plants are great here, below are a couple of images of the Crassula Ovata known as a prosperity plant which is known as a great plant for prosperity. This is a great space for it. A four leaf clover or plants which have grown very tall are good. House number 5 relates to health. The colours here are yellow and primrose and the shape is square. keep healthy plants here and make sure you avoid clutter at all costs. This house governs friendships and travels, and friends that help you on your path and journey. Some believe it also represents spiritual teachers and other figures that you might look up to. The Buddha for instance, Ganesh, Jesus or any other figure which may inspire you. The colors here are white, silver, gold, bronze and the shapes here are circle and arch. The element is metal, and it's a great idea to integrate metal finishes in the design of this area, as well as oval shapes, arches, in the windows or door frames for instance. Pictures of friends or images or symbolism of spiritual figures are great here. Earthy colours are great here, terracotta, yellow or peach. One old feng shui tip for this area is to keep a metal bowl which you fill with loose change until it's full, after which you give the money to charity. To amplify this energy, place a round mirror underneath the bowl. This house refers to all children, not just your own, but also children of friends, family members, etc. It's also the house for creativity because having children is the ultimate creative act. Therefore, it's a great area to focus on if one is either looking to get pregnant, looking to bring blessings to a child who is close to them, or to unlock creativity. The colors here are white, silver, gold, bronze and the shapes here are circle and arch. Using a lot of metal finishes here, like in house 6, is a good idea. Images of children are good here, or also a white vase with white flowers is good. This house is all about meditation, mindfulness, spiritual growth. Make sure this area feels quiet and still. Make sure it becomes a good area for you to meditate in. Crystals and statues representing spiritual guidance, ie: a Buddha statue, or a cross, are great here. Images of still landscapes and mountains are good here too. We will have another article looking specifically at symbolism. The colors here are purple, violet and maroon. House number 9 takes us to the end of the road, the full expansion of the self, the realisation. The illumination, fire, the highest achievement of perfection. It is about fame, realisation, becoming what we wanted to be, being realised. Answering questions like, what difference do I want to make in the world? This area is about being recognised for what we do, for becoming an expert in our field. The colours here are red and purple, the shape is triangle, diamond or star. Plants and candles in here are great as the dominating element should be fire. A fireplace would be excellent, otherwise red candles are great. the weave of the web, the labyrinth of life, the return to our center. To address the houses, we can begin by following the above principles, or the many more which exist in Feng Shui teachings, but I recommend using these only as a starting point, as guiding principles and only incorporating them if you really enjoy them and they really resonate with you. If a certain principle is meant to manifest, it will happen effortlessly. The right candles may show up a day or two after reading this, and you may find the perfect corner for them in house 2 or 9 without even thinking about it. If it feels like a struggle to get a picture of an odd number of fish for your "career / life path" area and you just can't make it happen, then it's not meant to be. I still can't stress enough that the process needs to be as heartfelt and intuitive as possible. Getting your space aligned with the higher good is about your personal growth. So every change needs to resonate deeply with your core. The above principles are only here for inspiration. The way to get the most out of a bagua mapping is to use personalised, intentional, creative and intuitive ideas which will vary from project to project and home to home. What this means, is that rather than using the fixed principles of Feng Shui, as per the examples above, we will instead choose ideas and placements that reflect the context of a specific space. To do so, we simply meditate and reflect on what it is we would like to experience in a certain area of our life and choose decorative principles which transmit that energetic frequency. For instance, if you are looking for passion and adventure in your relationship, perhaps a photograph of a volcano in the relationship area would be better than the two feng-shui recommended ducks. In my wealth area, I keep a glass bowl full of water in which I put flowers which I pick up from the ground as they fall from a nearby vine. This reminds me that the best things in life are free, and also abundant. The area where I sit and work, I made sure I could see a large picture which was shot by my close friend Stephen (we do joke that my house is a permanent solo exhibition of his work...) This picture symbolises courage for him as it was taken during a traditional Japanese ceremony and he had to get very close to the procession to take it, requiring him to face some fears. It therefore subconsciously reminds me to being brave in my work. In my ancestry area, I placed an old 60's Murano glass ashtray which my mother gave me, a way to honour the past. I also put a large and very potent crystal sphere, intending with it that harmony reigns over everyone in my family. Top left-A quick and easy way to use orientations is simply to intentionally place powerful crystals in the chosen areas which we want to bring awareness to. Top right- Creativity area sees lots of metal details, shelf and lamps, a vase with white flowers and a potent crystal as well. Bottom right- In my career life path area, an image which represents courage to remind me to bring this into my work. Breaking the rules... Placing a painting of a single man (probably me...) in my relationship area. Yet, a large wooden statue of a man and woman connected in a shape of infinity looms, restoring balance. It can even also happen that some things that Feng Shui recommends avoiding may be just right for you! For instance, I have a painting of a single man, painted by my good friend Stephen Morallee, on top of my bed which looks a lot like me. As we read in area 2 above, this would be bad Feng Shui as the recommendations favor pictures of a couple or a pair. But to me it just feels right. I did however place a large wooden statue of two lovers deeply connected as in an infinite loop near it. This works perfectly in accordance with the above principles and is the first thing I see when I wake up in the morning. Well, I'll be perfectly honest: I haven't yet manifested the relationship that (I think) I want.. but what has appeared instead is a sense of clarity around my feelings on the topic and (most importantly) a sense of peace about it all. I now constantly feel that all is in order in this area, and when something is meant to come, it will. No longer feeling "broken" because I am single is also quite an achievement, in my humble opinion! This type of inner shift is what we should be expecting and hoping for. The first step is having a conversation to choose which house(s) represent(s) an area in the client's life they need to bring attention to. Again, I recommend not trying to manipulate any specific outcome, but rather only bring awareness and energy to a specific area and watch changes happen naturally. This is a much more powerful way of manifesting lasting change. Decide which method you will use to apply the Bagua Map to the space. Once you have decided which method you will choose, apply it to the map and start walking around the space. Identify how a client feels in each space vs how they would like to feel in each space. What is the gap between both and what would it take to bridge it? It is a good idea to follow up after the changes have been done to evaluate their impact and effectiveness. Design decisions can be tweaked at this stag. The bagua map, being such a personal element, usually applies to a person's home, intending to have a shaping impact on their life. How do these principles get translates to a business context? If you have ever been to a chinese restaurant, you have surely seen some symbols such as a golden dragon, a waving cat or a three-legged toad, probably indicating that the owner / manager is paying attention to Feng Shui, and probably the Bagua Map of the space. So how, you may ask, does doing such a personal exercise have an impact on customers or others around? there are 2 main ways. First, as the Bagua Map is related to the earth's elements, paying attention to it helps to anchor the earth's elements in a home, creating a more harmonious relationship between the physical space and the Earth being. This harmony is similar to the one which was created by ancient temple makers when creating sacred sites. Second, the bagua map is a great way for the business owner to address their personal issues in their life. When the business owner is aligned, the space will be aligned, and the resonance of this energy will affect everyone who enters and interacts with the space. It's about creating a balance and a flow which people will be drawn to. Additionally, I also recommend you doing the bagua map work in your home as well, for an extra personal development boost which will also, most certainly, impact the business. Apply the Bagua Map to your home using the compass orientation method. Using your compass, locate the north. Walk in that direction, as far as you can go, until you reach the edge of your home in that direction. Stand as close as possible to the middle of that wall and turn so you are facing inwards, and picture your home being seperated in 9 parts, applying the above image map to your space. The space you are standing in is your career and purpose. The one straight before you is health, the one straight beyond that is fame and recognition, The one to your right is friends and travel, the one in front of that is creativity and children, and in front of that, relationships. On your left is the spiritual development house, in front of that is ancestors and family and in front of that wealth and blessings. If that didn't make any sense, it's fine... Just print the map, grab your compass and stand facing south and it will all make sense. A print version of the magua map is available to download and print here. I suggest you draw over it mapping out which rooms are in your home. Once you have done your Feng Shui map of your space, and you have chosen which areas you want to affect, I suggest walking around these areas and really getting a good feel for them. Does it feel like these physical areas really represent those parts of your life? If not, use your intuition to decide which ones do. Intuition rules over all. Let your heart rule as it wishes and the benefits will be much much stronger. So by now we have seen summaries of the Feng Shui principles, as well as the different ways your space can be mapped out, and we have also learned about the importance of following our intuition. Choose the 3 "houses" that represent the areas you want to affect in your life. Decide if you are following the Feng Shui mapping recommendations of the classical compass method, or choosing your own intuitively. Grab a notepad and draw a vertical line dividing the page in two parts. Stand in each of the chosen "houses" one by one and whilst standing there, dive inwards and pay attention to how you feel. Expansive? Contracted? Sad? Hopeful? Write it down on the left side of the page. Next, reflect on how you want to be feeling in this specific area of your life. Write that down on the right side of the page. When you are done, have a look at what has been written and pay attention to the gaps between the present situation and the desired one. Reflect on creative ideas which will bridge the gaps in each of those areas. These could be colours, objects, artworks, which enable the emotion that you want to be feeling in that area. you may even want to redecorate the entire space accordingly!In most cases with clients, we didn't have to buy anything at all, often only moving elements from one room to the next, or out of a dusty storage! And remember, this work is, above all, about intention. Therefore it is the intent behind the actions we take, as well as the actions themselves, which will make the real shifts happen.